My Parenting Journey: He got an award! So proud of my little boy! he got 4 award! 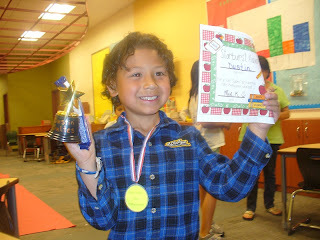 He got the responsibility award, the starburst award, a medal and a star trophy! He did really good at his studies and he is eager to learn more, he really love school and he is always happy to learn things at school. He is best in reading and also in his math subjects, he is also in the second grader reading class, the teacher said, you can't tell that he is a 1st grader because he really catching up with the 2nd grader and he always got 100% on all their quiz and activities. Proud of him, he is our little guy! ;-) love you dustin!